Siemens is a major world player in the control automation industry. 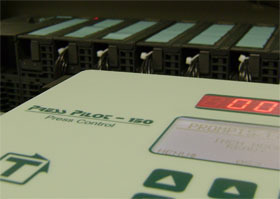 Our press controls department has done numerous Siemens controls around the world and here in the United States. We specialize in S7-300 PLC family and Sinamics drives. Our clutch/brake controller, the Press Pilot 150, can communicate with the S7-300 series via binary communications. If you're thinking of updating your press controls using Siemens or need to integrate with existing Siemens controls, read through our success stories below and contact us using the form below or at 1-800-TTOLEDO. Scope: Install and integrate our Siemens press controls and automation package into a 400 SPM press and feeder system using the Siemens S7-300 line, Press Pilot 150 clutch/brake controller and industrial HMI. Method: The automation package included die protection, programmable limit switches, brake monitoring and tonnage monitoring. These features were incorporated into the software programming and the necessary hardware was put into place inside the operator console. Siemens PLC's do not communicate via Ethernet/IP, so our Press Pilot 150 was configured to communicate via binary communcaitons to the Siemens PLC. 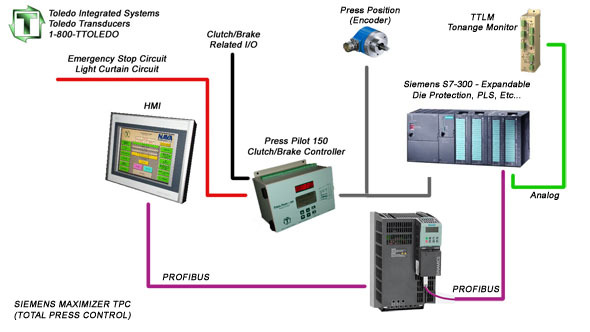 While the clutch/brake controller uses binary communcation, the HMI, Drive and PLC processor communicate via Profi-Bus. After a successful I/O check and verified communications, small changes were made to the software program to incorporate user requests such as lube timers and custom counters. Results: This press was being shipped overseas and therefore needed to be CE compliant. Our Press Pilot 150 (DC version) made this possible. This press has been installed and comissioned and is running to press specifications. We were able to succcesfully integrated the Press-Pilot 150, Siemens PLC and HMI into one central, easy to use unit for the press operator.